From 1-2:30 p.m. on Nov. 17, former Giants' first baseman Orlando Cepeda will be signing autographs and shaking hands with HumCo. Giants' fans. Have a baseball card that needs a John Hancock? Then, you are in luck! 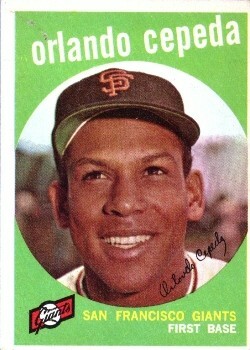 Cepeda played for the Giants from 1958–66, which I am betting is eight years longer than you played for the Giants. For more information on Cepeda's impressive baseball career, head over to The Baseball Hall of Fame.